Captured in a pen, this tapestry represents reincarnation, from the series of tapestries, the Hunt of the Unicorn. After the death of the unicorn, the unicorn lives again, and held captive by the royal hunters. The unicorn is surrounded by a mille fleur background or plants and flowers. 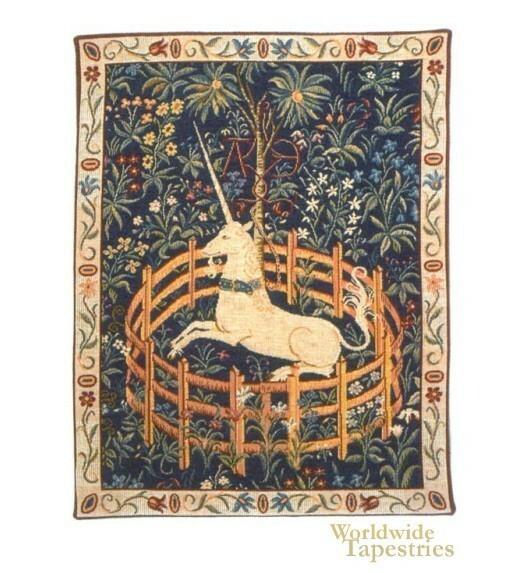 This unicorn tapestry Licorne Captive I is backed with lining and tunnel for easy hanging. Dimensions: W 16" x H 22"
Dimensions: W 27" x H 38"